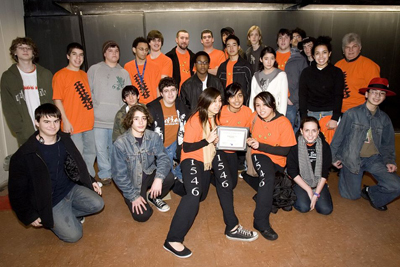 Baldwin High School was one of more than 30 teams to attend the 2007 Kickoff for this year’s FIRST Robotics Competition. They gathered with participating Long Island high schools on Saturday, January 6th at Stony Brook University for a presentation and simulcast broadcast from New Hampshire. After the presentation, each team received a kit of parts to help them build a 120 pound robot. The teams will have six weeks to construct the robot and prepare for the upcoming competition to be held on March 29-31 at Hofstra University. The Baldwin team is pictured here with the certificate of achievement they received as the creators of the “LI FIRST 2007 Musical Theme.” The team responded to a contest SPBLI proposed in the beginning of the school year for the best original composition. Baldwin’s track was selected by the committee from among 6 entries and will be played at all events and used for promotional materials. The distinction also netted the team a $1000 cash prize to be used toward completion of their robot.